Camp Helen is bordered on three sides by water; the gulf to the south and Lake Powell to the north and east. The 183-acre park is for day use only. 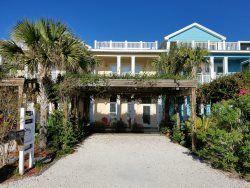 Activities include swimming, beachcombing, bird watching, nature study, hiking and biking on the trails, and both freshwater and saltwater fishing. History Tours are given the first Saturday of every month at 10:00AM; free with paid park admission. Over two hundred acres dedicated to outdoor recreation facilities at neighborhood and community parks surrounding the beaches. The playgrounds, picnic areas, saltwater fishing pier, freshwater youth fishing lake, greenways and trails are open to the public year round and are free from sunrise to sunset. Pet friendly trails and fenced in dog park. For information, please call. Softball / Baseball Fields, T-Ball fields, Soccer fields, Multi-purpose football fields, Tennis courts, Outdoor basketball court, Shuffle-board courts, Indoor gymnasium, Under the Palms playground, Large group picnic pavilion, Aquatic Center. See fascinating shows featuring dolphins, sea lions, tropical birds and reptiles. Explore exhibits showcasing sharks, penguins, alligators, flamingos and much more. Visit the stingray petting pool. Get up close and personal with the Swim With A Dolphin, or become a Trainer for a Day or attend a Dolphin Day Camp. The Tropical Garden Theatre offers night shows throughout the year and features magicians, family variety shows and musical concerts. The M.B Miller county Pier sits 1500 feet out into the Gulf of Mexico. Spectators can walk the pier for a daily fee of $2.00. Daily fishing licenses can be purchased for $6.00. Open all year. Fish caught in season: Cobia, King Mackerel, Spanish Mackerel, Red fish, Blues, Blue liners, Pompano, Flounder, Hardtails and other varieties. Rod rentals bait and tackle available on site. The Panama City Beach Aquatic Center is located in beautiful Frank Brown Park off Panama City Beach Parkway just west of Pier Park. The state of the art facility features a Heated/Cooled 50 Meter Olympic Pool with a one meter springboard diving well and a 5,000 square foot Splash Park. Offering a variety of exciting programs and events year round for swimmers and non-swimmers of all ages. Daily and yearly passes available. If you`re looking for the some of the best entertainment in Panama City Beach, you`ve found it at Rock`It Lanes. Featuring the following: 24 Bowling Lanes, 10 Pool Tables, 5000 Square Feet Arcade, 8000 Square Feet Roller Skating Rink, Sports Bar with new HDTV Big Screen TVs, and a Grille with everything from homemade hamburgers to Chef`s Salad with Grilled Chicken Breast at family prices. Coconut Creek Family Fun Park is a great place for children and adults. The park`s beautiful landscaping provides the perfect setting to enjoy two, 18-hole Mini-Golf courses and the Gran Maze: a giant labyrinth about the size of a football field and offers unique and fun challenges. Open year round. On behalf of the more than 5,000 Airmen of Team Tyndall, it is my pleasure to invite you to the 2015 Gulf Coast Salute open house and air show on April 11 and 12. The base gates will open at 9:00 am each day; admission and parking are both absolutely free. The Sea Screamer Cruise is an exciting way to experience the beauty of Panama City Beach. The spacious and comfortable twin turbo powered 73-foot boat offers a smooth yet thrilling ride, unlike any other. While taking in the beautiful scenery, tour throughout the Shell Island waters and near the State Park area jetties then go for a refreshing 10-mile ride alongside the world�s most beautiful beaches and resorts. Spend 3 to 3.5 hours leisurely paddling. Add your recreation time and tell us how you want to spend the day. Swim and snorkel in crystal clear, sandy bottomed springs. Bring a picnic and make a day of it. Enjoy lush tropical vegetation, unique honeycomb limestone banks, and six major spring areas which combine to make this Florida`s Most Beautiful Canoe Trail! Here are a few items to remember to bring on your next adventure: food, plenty to drink, sunscreen, hat, sunglasses, water proof watch, cash and insect repellent. Explore the amazing world of Robert Ripley in this one of a kind Odditorium. You`ll see amazing exhibits, unusual art and genuine artifacts from around the world. Over 400 exhibits are on display in 13 differently themed galleries. You can also experience Ripley`s 4D Moving Theater - a simulated coaster ride that puts you right in the middle of the action without the actual upside down and drop actions. Young or Old, the Pirate Cruise has Something for Everyone! Cruise away into the fantasy world of friendly swashbucklers and spirited pirates aboard their real 85` pirate ship. Frequent sightings of the playful dolphin, gliding seagulls, pelicans, and other mysterious marine life just adds to the excitement! For ye noble pirates, cold beer, wine, margaritas and rum punch are available. Sodas, bottled water, pink lemonaid, "Dragon tail" hot dogs, and other fine snacks as well as treasured keepsakes can be purchased in the galley. The tropical theme waterpark is filled with attractions and food and beverage outlets to bring smiles to every member of your family. The twenty-acre park features lush landscaping, a professionally trained aquatics staff, and is one of the most hospitable attractions in all of North Florida. Shipwreck Island has been entertaining families for twenty-five years on Panama City Beach. WonderWorks is an amusement park for the mind with 35,000 square feet of "edu-tainment". The attraction combines education and entertainment with more than 100 hands on exhibits that challenge the mind and spark the imagination. At ZooWorld, we get you up close and personal with exotic animals from around the world!